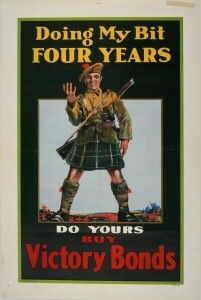 Like most other combatants in 1914, Canadians expected the war to be short, victorious, and relatively inexpensive. They were wrong. Far from ending the pre-war economic recession, the war’s outbreak at first worsened it, with layoffs, contract cancellations, and severe cutbacks in the already-troubled railway industry. 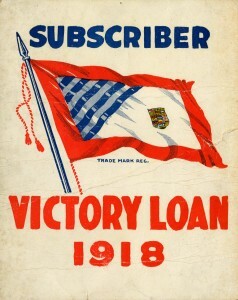 Ottawa sought money to pay the war’s modest early expenses by borrowing in traditional capital markets – first Britain and then, as British loans dried up in response to domestic needs, the United States. Few observers believed that Canadian financial sources would need to be tapped before the war ended; fewer still supported using taxes to raise money to finance war expenditures, instead of borrowing it by raising war loans. But the war did not end quickly. 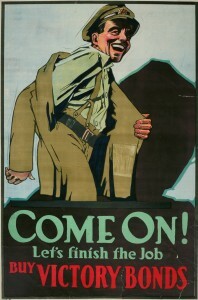 The effort required to sustain massive armies in the field rescued the Canadian economy from recession. It also required huge amounts of capital. 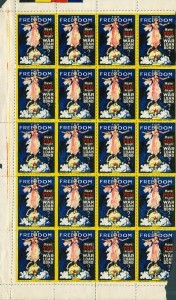 A pre-war federal budget of $185 million had quadrupled by its wartime peak to more than $740 million. Debt quadrupled to $1.2 billion as well. Prior to the war, customs duties, postal rates, and tariffs on imported goods had accounted for more than 85 percent of government revenue. Higher duties and new tariffs alone could not hope to cover vastly higher wartime expenditures. Ottawa borrowed to finance the shortfall from an unexpected source: ordinary Canadians. 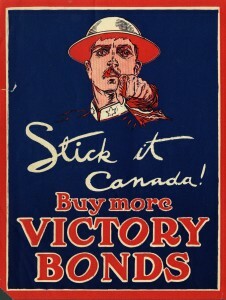 Canadians’ willingness to loan money to their own government by buying war bonds exceeded all expectations. 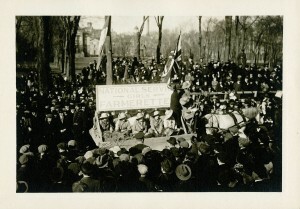 No bond issue in Canadian history had raised more than $5 million, but Ottawa’s first “victory bond” drive brought in $100 million, twice the initial estimate. Subsequent drives proved just as successful. 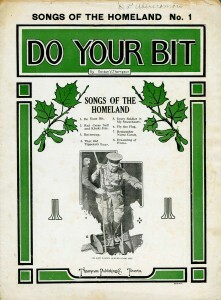 Publicity campaigns, including tens of thousands of posters, linked buying bonds to the direct support and welfare of soldiers overseas and used a variety of messages to encourage contributions, from well-known poems to emotional imagery. Long-term interest rates of up to 5.5 percent for terms of up to 20 years were also a powerful inducement. 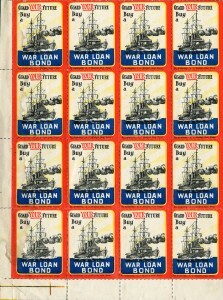 Total domestic bond purchases during the war exceeded $2 billion, ten times the amount of money raised abroad. Canada had financed the war by incurring more than $2 billion in debt, thereby passing the war’s costs to future generations, but it owed most of this money to Canadian citizens, not foreign lenders. 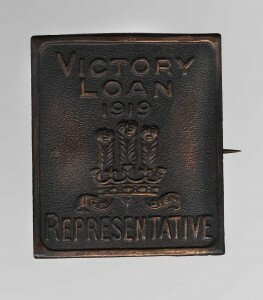 The success of the “victory bond” campaign would be repeated during the Second World War. 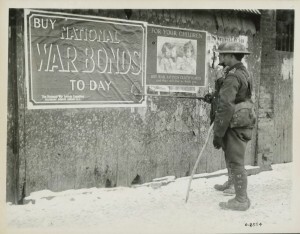 Today’s Canada Savings Bonds are the direct descendents of these wartime efforts. New federal taxes on business profits in 1916 and personal incomes in 1917 – the latter a ‘temporary’ wartime measure – set important precedents, but the war ended before either had produced substantial results. In 1919, personal and corporate taxes combined accounted for only 3.4 percent of total federal revenues. Most Canadians paid no tax at all, and those who did pay, paid very little. The outbreak of war threatened Canada with economic crisis. 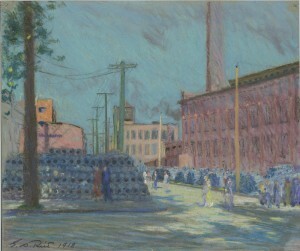 Existing manufacturing orders were cancelled, some factories shut down, and construction halted on many pre-war civilian projects. Some feared that war would cause the collapse of Canada’s already fragile economy. 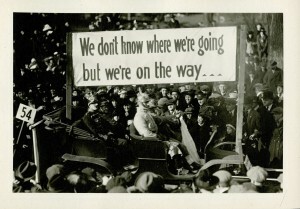 But the demand for war supplies, equipment, and shells soon provided economic stimulus and employment. Output grew and fears of collapse were replaced by the challenges of rapid expansion. Due to the combined demands of military service, industry, and agriculture, unemployment had virtually ceased in Canada by 1916. One of the greatest economic surprises of the war was the military’s near-insatiable demand for vast quantities of artillery shells. Armies expended them by the millions in the great barrages and siege-like battles on the Western Front, and no Allied economy was organized to produce shells in anything near the quantities required. 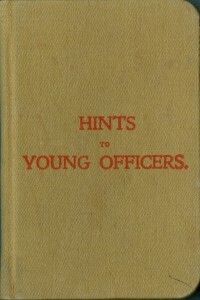 Canada’s Minister of Militia and Defence, Sam Hughes, initially established a Shell Committee to coordinate production, but its failure to deliver on contracts led to angry recriminations between Canada and Britain and widespread rumours of corruption. 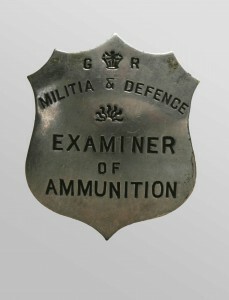 In late 1915, Prime Minister Borden replaced the Shell Committee with the Imperial Munitions Board (IMB), which answered solely to Britain but was run by a Canadian. Under well-known Toronto businessman Joseph Flavelle, the Board was organized according to sound business practices and hired professional managers to oversee its operations. 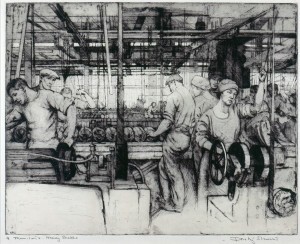 It eased the problem of scarce labour by hiring 30,000 women to work in its factories and offices. 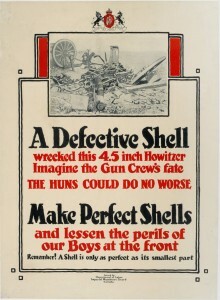 Under Flavelle’s supervision, the Board oversaw an impressive expansion in wartime production, from only a few companies having the capacity to produce shells to, in 1917, dozens of companies, including crown corporations, that collectively produced some $2 million worth of goods per day. 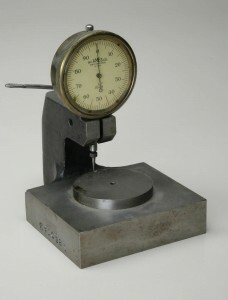 The IMB’s mandate later expanded to include propellants, brass casings, and complicated fuses. 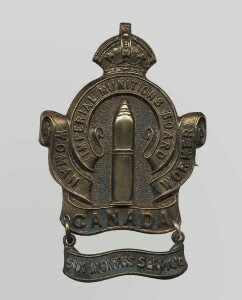 By 1917, almost one-third of all British shells were being manufactured in Canada. The IMB constructed ships and aircraft and developed airfields for a large pilot training program. 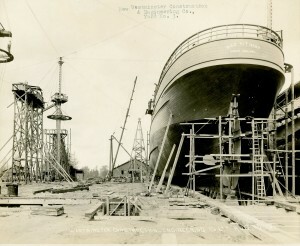 By war’s end, its 600 factories had completed some 103 naval vessels, 2,600 training aircraft, and 30 flying boats. When the IMB ceased operations in 1919, it was Canada’s largest civilian employer, with over 289,000 employees. 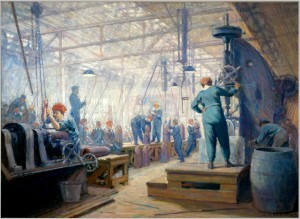 This painting by George Reid depicts women working in a factory. Of the almost 300,000 factory workers engaged in war production in 1917, approximately one in eight were women.